The year 1975 was a tumultuous one around the world – the war in Vietnam escalated and then came to an end, political assassinations abounded, there were revolutions and natural disasters. In the midst of the turmoil, however, it was a banner year for sports. Muhammad Ali and Joe Frazier whipped the world into a frenzy with the fight that was dubbed the “Thrilla in Manila,” Bjorn Borg, Arthur Ashe, Chris Evert and Billie Jean King were the stars of tennis, while Jack Nicklaus and Tom Watson ruled the fairways. It was the year of the great filly Ruffian, who overshadowed her male counterparts, but lost her life after breaking down in a match race with the Kentucky Derby winner Foolish Pleasure. On March 26 of that same year, Nancy Mann (then called Nancy Bielan) won the third race at Rhode Island’s Lincoln Downs in what was only her third start as a professional jockey. The horse, a 6-year-old chestnut gelding named Norse Plume, paid $82.80 for the win. Nancy was 19 and was less than a year out of high school. Norse Plume was owned and trained by Florence Gemma, a wellrespected trainer in New England. 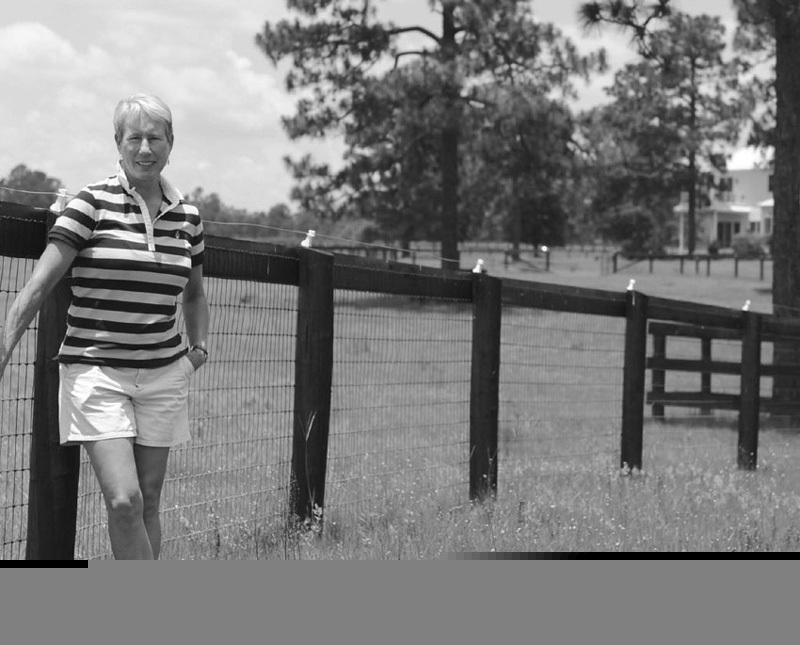 Fast-forward several decades - Nancy is now living in Aiken and designing equestrian properties. Quite a transition from the life of a jockey! Ballet and art classes were the norm for Nancy, but she begged for (and received) her first horse when she was 10. A few years later she got a really good pony and although he frequently ran off with her, he would jump anything. During summers and on weekends Nancy spent most of her free time at the Palmer River Riding Club, honing the riding skills that would be invaluable to her later on the track. She fox hunted, showed jumpers and was in Pony Club. She also rode her fair share of Thoroughbreds fresh off the track. While Nancy was still in high school she caught the eye of Terry Dunleavy, a local trainer, who, after seeing her in action at a Pony Club rally told her she should be at the race track galloping horses. He introduced Nancy to several trainers and before she knew it she was exercising horses on weekends and during summer vacations. As soon as Nancy graduated from Barrington High School, she was off to the track. In those days a rider had to be apprenticed to a trainer, and Florence Gemma took Nancy under her wing. After her win on Norse Plume, there was no stopping the young jockey. 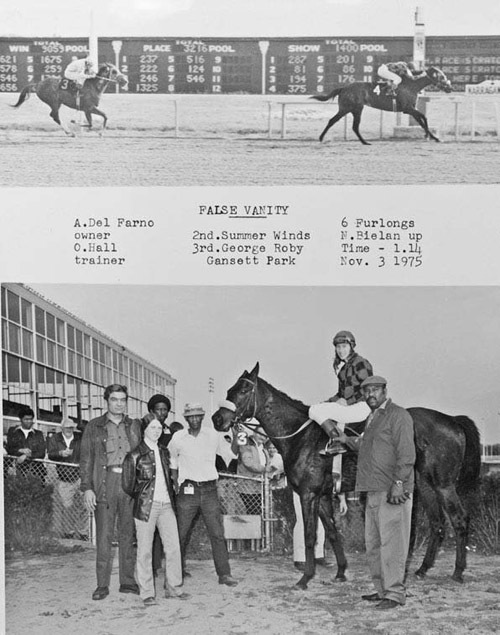 She continued to ride at Lincoln Downs, then moved on to Narragansett Park, the track where she had the most success. On October 16, 1975, she rode two winners on the card – Lorello and Summer Winds. In one win picture she is in pink silks, in the other in yellow, but the smile is the same – that ear-to-ear grin of a teenager living her dream at 19. With the confidence earned from her success at Lincoln Downs and Narragansett, Nancy moved her tack to Suffolk Downs in Boston and Rockingham Park in Salem, New Hampshire; larger tracks with better purses. The flip side, however, was that at Suffolk there was a pre-existing jockey colony that was tough to crack. That changed when a horse she was on went down in a multi-horse crash, catapulting Nancy to the ground. She was in the hospital several days with internal bleeding and both shoulders dislocated. It could have been worse and she knew it. Not sure what she wanted to do with her life, Nancy worked for the well-known horseman Mason Phelps for a year at his Newport stable, going back to her roots in the hunter jumper world. Nancy knew she could and should be doing more with her life and so did her family. Her stepfather had heard about American Intercontinental University, a design college in London, and helped Nancy go there. She finished her degree in three years and made the most of her time in Europe, traveling to all the great cities and soaking up the culture. Nancy has been on the university’s board of trustees since 1986 and the board’s chairman for the past two years. “I took zillions of photos during that time – learning so much about color and detail – and I have used that in what I design today,” she explains. Upon graduation Nancy returned to the United States and moved to Atlanta where she became district manager for GF Furniture Systems. After several years of the corporate world and travelling five days a week, Nancy felt as if it was time to move on. She consulted on the design for the first equestrian subdivision in the Southeast – Tullamore in Alpharetta, Georgia. She was not yet ready to settle down, however. Nancy sold her Tullamore property, moved to the north Georgia mountains, got a few horses, built another farm, and started a home design and building business. She packed a lot into the next few years, but when she hit 40 she knew she had to have time for herself. “My parents had moved to Hilton Head and on one of my many trips to visit them I took an alternate route and ended up driving through Aiken. I fell in love with the town,” she says. One of the first people she connected with was Linda Knox McLean, which led to rides in the Hitchcock Woods and eventually hunting with the Aiken Hounds. In 1996 Nancy purchased property on Coker Springs Road and set about designing and building a home that met the stringent requirements of Aiken’s historic horse district. From there she purchased 50 acres on Route 302 and developed two farms. Horses and riding were still in her life. She whipped-in for Aiken Hounds starting in 1998 and eventually held the same position with Why Worry Hounds from 2000 to 2002. She also learned the art of navigating in driving competitions, teaming with Peggy and Megan Benge beginning in 2000. In 2005, she went to the World Combined Pony Championship in England to navigate for Jennifer Matheson, who represented Canada. At 56, Nancy laughs that she is a really late bloomer and that she’s only hitting her stride right now. She works frequently with Mitch Johnson, a local builder, and brings to the table not only a horsewoman’s experience in what works in a barn and farm, but also a lifelong passion for design – whether it is the marriage of heart pine and old brick in a new home, or finding the perfect color of paint for a light-filled bedroom. Last year Nancy was given free rein to develop an Aiken property for Dana Pope and his family, who call Massachusetts home for much of the year. 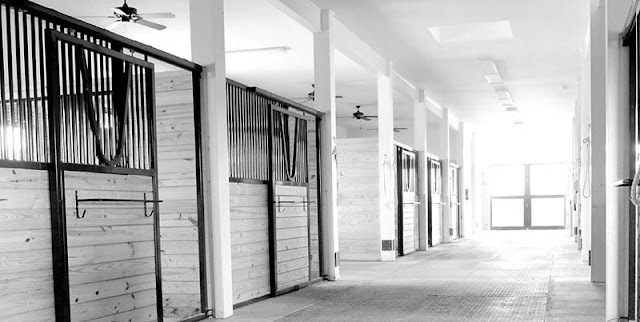 Their trainer is Sarah Morton, so the property encompasses a barn for their horses as well as for horses belonging to Sarah’s clients. The Popes wanted their home to have understated elegance and yet be comfortable for family and friends. “Nancy offered us a soup to nuts building experience, walking us through site layout, building design, functionality of interior spaces and finally interior finishes that reflect a southern charm. Building a horse farm and home from New England can be nerve wracking. Nancy, as a horsewoman with a great sense of humor, knew what we needed and wanted and made it fun,” explains Dana Pope. The Popes’ property, named High Meadow Farm, is the latest chapter in Nancy’s varied life, but certainly not the last.